Written as events for the GenCon Gaming Convention over 2006 thru 2007, this booklet of scenarios made for Tunnels and Trolls 7th edition has a whole lotta pudding. 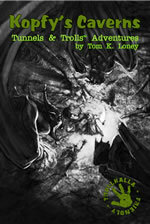 One of Trollhalla's elite, Kopfy the Magus, also called Tom K. Loney, has put together the great art of Diego Gisbert Llorens, Regis Moulun, Daniel Chapman, and some others, and worked in his own Tunnel Hack random encounter system into three high fantasy adventures. All three are woven into a coherent work by the chimera Perrryton, also known as Christina Lea. There are even pre-generated player-characters for the GM and players in a rush. Trolls Below, a beginning level adventure. A gang of explorers check out the disturbances that have closed down the mines of Goldenstreams Crag. Troll Wood, for more experienced player-characters. Characters help a mysterious elf-maiden return to her homeland in the far away and magical kingdom of Die Wald. Mt. Loki, for pretty experienced player-characters. Trapped in world of their own making, perhaps the only way to survive this desolate island is delve deeper. So pull out that dice bag and let the six-sided dice blot out the sun, as you hack and flash your way to victory, and some great role-playing sessions. Don't have T&T but still want to play Kopfy's Caverns? Download our RuinCrawl rules for 99 cents. A few minutes' worth of tinkering and you'll be ready to go!